all Stainless. 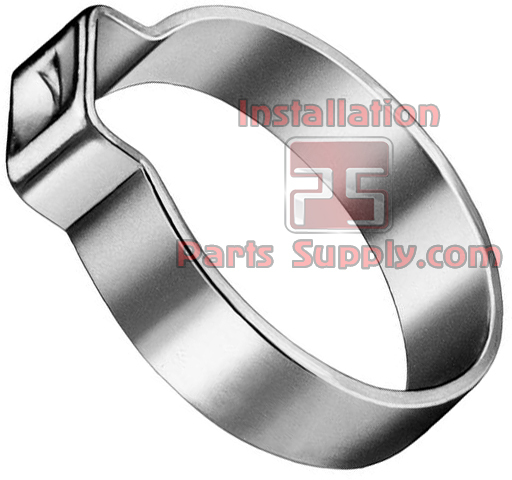 These clamps are superior to the 2 ear zinc clamp for corrosion resistance and tube-end pinching. OETIKER Group 153 1-Ear Clamps are generally used where a quick, repeatableand compact assembly is important in addition to the necessity foronly a small clamping range. OETIKER 1-Ear Clamps are suitable for use by OEMs, but are also idealfor maintenance, repair and service purposes. With this design ofclamp, rubber hoses, plastic tubing, electrical cables, welding hoses, and numerous other materials can be rapidly and securely fastened. OETIKER System Â– the ear with the integrated dimple. This conceptensures that the geometry of the closed ear remains as low as possible, in addition to maintaining the effective clamping force. The closed eargeometry provides an inherent spring action in the clamp, permittingexpansion and contraction during thermocycling conditions withoutexcessive loss in retention. For optimum sealing performance, it is essential that the ear is correctlyclosed during installation.